Administer antibiotics, stool softeners, and antispasmodics, as ordered. For severe pain, administer analgesics as ordered. 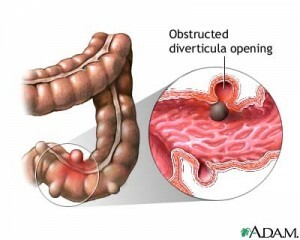 Maintain bed rest for patient with acute diverticulitis. Maintain liquid diet during the acute attack. If diverticular bleeding occurs, the patient may require angiography and catheter placement for vasopressin infusion. When administering medications, monitor the patient for desired effects and possible adverse reaction. Inspect all stools carefully for color and consistency. Note frequency of bowel movements. Monitor the patient for signs and symptoms of complications. Watch for temperature elevation, increasing abdominal pain, blood in stools, and leukocytosis. If the patient has had angiography for catheter placement and vasopressin infusion for diverticular bleeding, inspect the insertion site frequently for bleeding. Instruct the patient to notify the doctor if he has a temperature above 38.3 °C. Teach the patient about necessary diagnostic tests and prescribed treatments. If a colostomy is constructed during surgery, teach the patient how to care for it. If the patient expresses anxiety, provide psychological support. 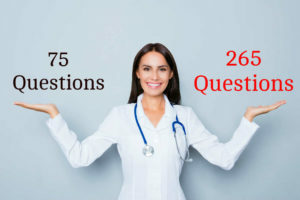 This entry was posted in Nursing Interventions and tagged diverticular disease, nursing interventions, nursing management for diverticular disease. Bookmark the permalink. thᥱ amazing ᴡorks guys I’νe ɑdded yоu guyus tto blogroll.